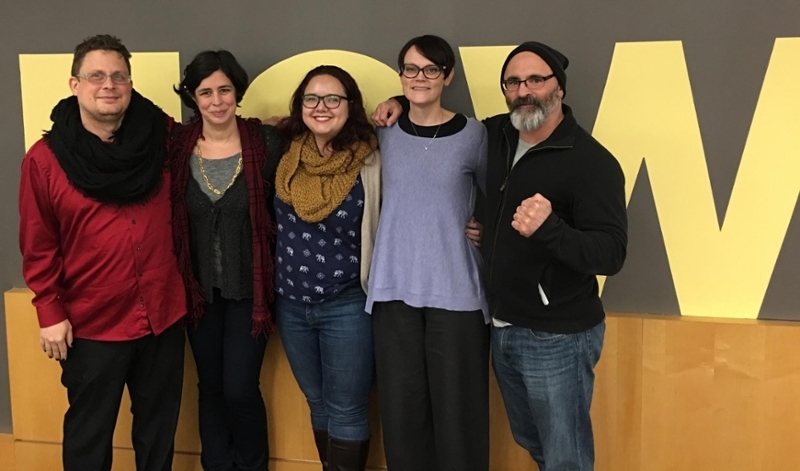 Martin with her graduate committee: (L-R) Jason Palmeri, Lizzie Hutton, Caitlin Martin, Elizabeth Wardle, and John Tassoni. Thomas Poetter from EDL not pictured. Composition and rhetoric PhD candidate Caitlin Martin's dissertation research project, "Facilitating Institutional Change through Writing Across the Curriculum (WAC) Faculty Development" was selected for inclusion in the 2019 Dartmouth Summer Seminar for Composition Research on "Data-Driven Research: Process, Methods, Results." The Seminar is a two-week intensive research program offered by the Dartmouth Institute for Writing and Rhetoric and the Council of Writing Program Administrators that brings together composition researchers to develop expertise in understanding, choosing, and using quantitative and qualitative methods for data collection and analysis on higher education writing research. Martin is working with Elizabeth Wardle, director of the Howe Center for Writing Excellence, to develop her project, which draws broadly on scholarship in writing across the curriculum, faculty development, and institutional change theories to explore how WAC programs understand and influence institutional writing cultures. "I'm really excited about the opportunity to work on my dissertation research while also learning more methods and strategies for data collection and analysis, all while working with writing studies scholars whose work I admire," Martin said. "Also, I'm really grateful for the support and encouragement from Liz, the rest of my committee, and both the English Department and the Howe Center for Writing Excellence, without whom this would not be a reality."